I'm tired of catching planters. For the last 6 weeks I have been fishing the Boise River even though the flows have been faster than normal. I was inspired to write about some of my findings from Chris' report from "The Driftless" region of Wisconsin. I lived there for 5 years. I would like to share some lessons I have learned. I have had several "many" fish days and caught several 14-16 inch rainbows and browns. I have been doing very well fishing a new technique stolen from Finesse-Fishing.com. The normal JH85 jighead hook is much too heavy for a tenkara or keiryu rod. 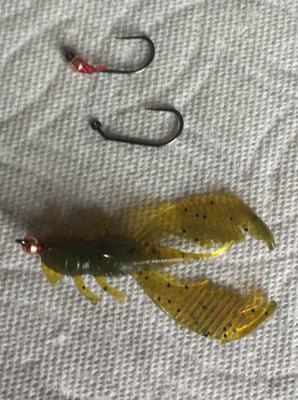 So, I have made my own with Czech nymphing jig hooks. A 3mm tungsten bead works very well with a size 8 hook. I have been fishing the micro finesse "Metacraw", and yesterday just hammered the trout! Chris is going to be carrying the Micro Finesse Metacraws on the Finesse-Fishing.com site, so keep an eye out for them. What has worked well is to cast to the edge of the current, and then imitate the swimming motion of a crayfish into the calmer water. One of my most memorable battles from yesterday was watching a 15 incher nail the jig in about 4 inches of water. It was a dramatic commotion as he felt the hook and turned to head for deeper water! The first run was a real adrenaline rush! I would also like to address the issue Chris talks about with the .4 gram spoons in his report from Wisconsin. Everyone needs a friend in England who is a roach fisherman. My friend Luke has taught me a lot about using shot for trimming your bait or lures. One of the easiest ways to get a .4 gram to fish as deep as a .8 gram spoon is to add a Dinsmores BB shot. It weighs .4 grams. Even better is to progressively use Dinsmores number 6 (.1 grams) and fine tune with Dinsmores number 10 (.06 grams). Another advantage I have discovered using this method to get the spoon deeper is that it still allows the advantage of the action of the lighter spoon. I make sure I leave at least 6 inches between the last split shot and the spoon. Last but not least, I have found that fishing spoons and jigs works best with a rod that has a tip diameter greater than .5mm. For those that are wondering if I have abandoned my worms, I have not. There are places that they won't let me fish my worms! These are two great alternatives. Les: In the future when you show photos of hooks, srw, crawdads, etc. please include a penny or dime in the photo so we can get an idea of actual size. Thanks! I'm enjoying fishing with spoons almost as much as with Red Wigglers. What is interesting as I think about fishing with my morning cup of coffee is how different the "ideal" rods are for each type of fishing. In my opinion a rod rated for 9x or 10x is ideal for ultra light worm fishing (see Chris' article under the Worm Fishing Tab). The "ideal" rod for spoon fishing is much stiffer. I bought the Suntech Genryu Sawanobori 45 as a wind rod. I was fishing the TenkaraBum Traveler 44 in one of my favorite spots on the Snake River for smallmouth bass when the wind came up and blew the tip so hard, there was no way you could detect a strike with the Traveler. The Genryu Sawanobori was bought as a wind rod, and does an awesome job in the wind. Fly Rod Spoons were not a part if my thinking a year ago. With a 1mm tip, this to me is the ideal rod for spoon fishing. It can handle both the .4 gram and the .8 gram Vega spoons. Chris often talks about poorer hookup rates with the single hooks. After several sessions with both the Suntech Genyru Sawanobori and the TenkaraBum 40, I am convinced that I get a higher percentage of hookups with the Sawanobori because of the beefier tip. Soft tips and spoons are not the best combination. If you are looking for a Spoon Rod, look no further than the Genyru Sawanobori. Two outings ago, I couldn't catch a fish on flies or worms. I switched to the .4 gram spoons and had a many fish day. Several times I could see 3 or 4 trout racing to hammer the spoon. A couple of times, I was laughing so hard, I almost missed the fish! Looking for a great spoon rod, the Genyru Sawanobori is hard to beat. My second choice is the Kyogi 15. That said, planters are not much fun on the Kyogi. The fight is over too soon! Just to make myself clear, the above comment about the TenkaraBum 40 isn't a criticism, but an observation. In my book, it is the best all-round rod out there. I don't hesitate to fish it with spoons or worms or flies. It is my "go to" rod.